Mark Hill Publishing Ltd uses industry leaders WooCommerce and Paypal to ensure you can buy our books and objects swiftly, safely and securely. You will receive online notification of your successful purchase, after you have completed the Checkout process, from both WooCommerce and Paypal. You don’t even need a Paypal account to pay, as you can also pay via Paypal by VISA, MasterCard, American Express, SOLO, Maestro or Delta, wherever you live. We do not see, handle or store credit card details, and nor do we share your personal data with third parties. 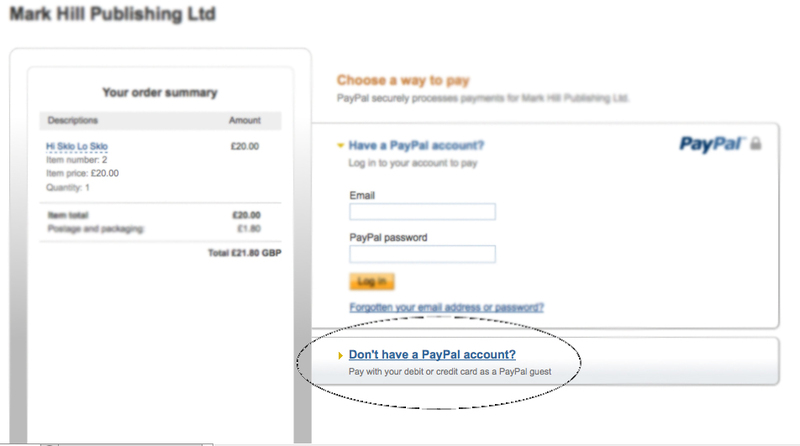 If you do not have a Paypal account, simply click the yellow and blue ‘Checkout With Paypal’ button after choosing your book(s) or item(s) and correct shipping option, and you will find an option to pay with a credit or debit card underneath the Paypal log in box. See the screenshot on the right, or click it to enlarge it. We will usually pack and send your book or item within three days after payment clears. Delivery times for addresses outside the United Kingdom will be longer, so please allow for this. In all events, please allow up to the statutory 28 days for delivery. Once your book or item has been shipped, you will receive a notification email from us, via our WooCommerce shop software. All postage and packing rates quoted do not include insurance or tracking, unless stated. If you would like insurance or tracking, please email your request in advance to Customer Services at books@markhillpublishing.com. We ship our books worldwide via Royal Mail’s standard First Class service. Overseas order are sent using their standard Airmail service. We do not ship via surface mail. If you would like to purchase more than one book, please contact us so that we can obtain a combined postage and packing rate for you. If you would like to buy an object or a piece of glass or ceramic, please note that all prices do not include postage and packing. All postage prices are set to £0.00. Once you have successfully paid for the piece using the same shopping cart system as for books, we will contact you to discuss how you would like it packed and shipped, and whether you would like it insured on its journey. This is for your convenience – you may even wish to collect it in person! We will then invoice you for the cost of postage and packing. Orders sent to addresses within the UK will be sent FREE OF CHARGE via Royal Mail Special Delivery. Packing, shipping, and insurance are charged at cost – we don’t make money from this service. Can I use my own choice of shipper? If you would like another form or method of shipping other than Royal Mail, please email your order and request to books@markhillpublishing.com. We will then invoice for your order and your preferred shipping method together, with the requested services being charged at cost unless account details (such as a FEDEX account) are supplied. Although we’ll do our best, we cannot guarantee that we can work with all shipping methods and shippers. As Publisher, Mark Hill Publishing Ltd holds nearly all stock of all our books, except Dartington Glass, in our warehouse. We only offer trade discounts to bookshops and retailers, and you will never find our books at reduced prices in discount ‘bargain’ bookshops or on similar stands at antiques fairs. Your copy will not be delivered quicker if you order via Amazon or a bookshop, although you may prefer to do this. They will have to order a copy from us, and we’ll have to send it to them before they can get it to you. We do often list our books on eBay, and you can visit our eBay shop by clicking here. However, buying direct from this website is the best and fastest way of buying one of our books. If you would like your book signed or dedicated by Mark Hill, please indicate this, including any dedication you would like, in the Notes field of the Paypal payment form. If you would like to ask about our trade terms, or order a quantity of books, please email Customer Services at books@markhillpublishing.com.